The U.S. House of Representatives passed a sweeping tax bill, the Tax Cuts and Jobs Act, on Nov. 16. Meanwhile, the Senate finance committee approved its version of the bill, which diverges from the House version in several key ways. Despite a short timeline, President Donald Trump pledges to deliver tax reform as a Christmas gift to Americans. The Senate is expected to vote on its bill after the Thanksgiving holiday. For tax reform to become law, the bills have to be reconciled, and Trump is confident that the chambers will work out their differences. According to Kevin Hassett, the chairman of the White House Council of Economic Advisers, both the House bill and the Senate bill, despite their differences, meet the three main objectives set by the president. Those three, non-negotiable objectives are a 20 percent corporate tax rate, a big middle-class tax cut, and a simplified tax code, he said during a press briefing at the White House on Nov. 17. Both bills reduce the corporate income tax rate from 35 percent to 20 percent, which is the centerpiece of this tax reform. A few Republicans have voiced concern over the tax bills. Sen. Ron Johnson (R-Wis.) was the first Republican to come out against both plans, claiming the tax cuts favored large corporations over small businesses. “We’re leaving those pass-through businesses behind. And those pass-through businesses are the engine of economic growth, job creation, innovation in our economy,” he told CNN on Nov. 16. Many small businesses in the United States are structured as pass-through entities, meaning that their earnings pass through the business owner’s tax returns and are taxed under the individual income tax. Pass-through businesses include sole proprietorships, partnerships, and S corporations and are taxed at an individual rate of 39.6 percent under the existing tax code. Critics say the provisions regarding pass-through entities in tax bills are too complicated and do not provide tax relief to small businesses. Hassett said it’s appropriate in the legislative process to expose the bills to scrutiny and debate. “The president supports regular order because that’s really how deals get made and how bills become law,” he said. 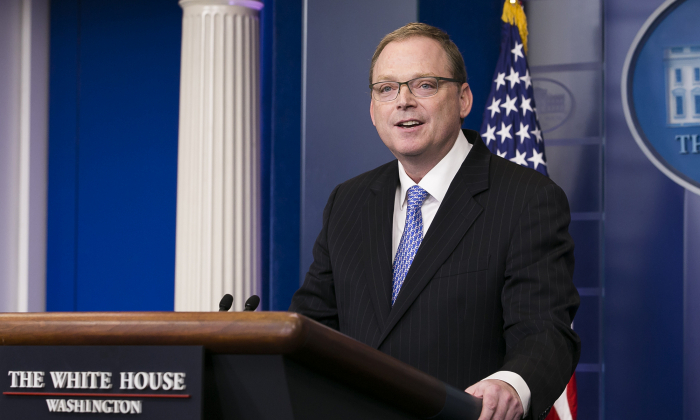 Hassett is confident that tax reform will bring economic growth. He said the countries around the world that cut their corporate tax rates have all experienced an increase in economic activity. “In every economic model I’ve seen, you get growth—either a lot of growth, or sometimes if it’s a closed economy model, a little growth,” he said. The House bill is expected to boost long-term GDP by 2.6 percent, and the Senate version is projected to increase GDP by 2.8 percent, according to a report by The Heritage Foundation, a conservative think tank. The increase in GDP translates into an income rise of $4,000 to $4,400 per household, states the report. Trump has criticized the existing tax code for pushing businesses and jobs overseas. American firms avoid U.S. tax by locating their activities in a low-tax country like Ireland. For many years, U.S. corporations have left cash in their foreign subsidiaries to avoid paying high taxes. The total amount of accumulated income across all industries is more than $2.5 trillion, according to estimates. “If you build a plant in Ireland, then you can sell the stuff back into the U.S. And when you sell the stuff back into the United States, then it increases the trade deficit and doesn’t do anything for American workers,” Hassett explained.